You take the good with the bad. A fact of life that is all too true in relation to summer weather. While Mother Nature can spoil us with her bright sunny days and warm breezes, she still manages to let us know who’s in charge now and then. While the temptation may be to enjoy the nice days to their fullest, it may also be prudent to make good use of those days and prepare for the dark, stormy weather that is certain to come. While there are many levels of preparedness that homeowners can practice, we’ll cover some tips which should cover most storms and give the most bang for the buck. High winds and water can take a toll on your home’s roof. Loosened shingles can be easily fixed and will save a lot in costly repairs down the road. Look for problems along the roof’s edge and on the gable ends. If you find any loose shingles, purchase a couple tubes of roofing cement and apply three 1 inch circles of cement under each tab. Along the gable ends, make sure you check at least three shingles in from the edge. High winds can force water into gaps where it normally would not penetrate. To avoid water damage, seal all visible gaps with exterior caulk. Look for common areas such as openings for pipes, wires and conduit on your home’s exterior. Also seal around electrical boxes, dryer and exhaust vents, and lighting. Inspect your home’s siding, soffit and fascia for cracks, gaps and loose components. 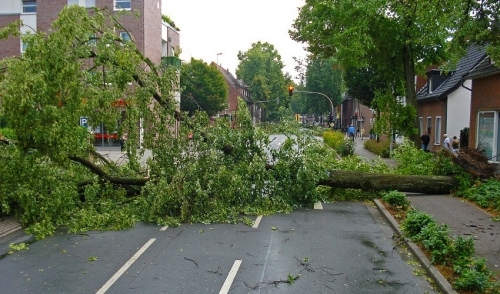 Secure and seal all problem areas before a storm makes things worse. If you know a storm is eminent, take a look at your home’s surroundings. What might seem harmless now, can become a projectile in a high wind situation. Secure patio furniture, toys and garbage cans, for example. Inspect the trees in your yard for dead or dying branches. It is best to take them down on your own terms, rather than wait for them to cause injury or damage to home and property. If a tree looks like it may be dead or dying, consider removing it altogether. 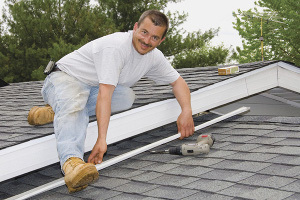 If any branches are in contact with your roof or siding, trim them back. In a storm, the wind can cause these branches to knock up against your home, loosening roofing materials and causing damage to your siding and windows. Consider operable shutters and impact resistant windows for your home. In many cases, having them installed can give the additional benefit of reduced insurance costs. You may also want to consider replacing your roof vents with newer, wind resistant models. Reserve a space in your pantry (or even install a cabinet) for the specific purpose of storm preparedness. You can use it to store flashlights, batteries, candles, bottled water and dried fruit for use during emergencies. An emergency weather radio is another good thing to keep in there. Just in case, it may be a good idea to keep a copy of your homeowner’s insurance paperwork in a watertight container and tuck it in your cabinet, as well. With our reliance on power for so many aspects of our lives, consider purchasing a generator to keep your home’s vital systems running during a power outage. The old, “ounce of prevention/pound of cure” adage definitely applies when it comes to storms. For all of your home preparedness needs, or if you are making repairs from the last bout of bad weather, we’re here to help. Stop in and ask our knowledgeable staff and we’ll do all we can to help you weather the storm.